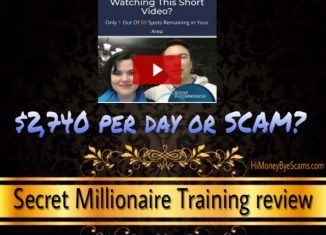 Secret Millionaire Training review - Scam or $2,740 per day? Home > Online opportunities > Secret Millionaire Training review – Scam or $2,740 per day? Secret Millionaire Training review – Scam or $2,740 per day? Welcome to my review of Secret Millionaire Training! You’re here because you’ve come across secretmillionairetraining.com and are wondering whether this one will make you the money you desire or is Secret Millionaire Training just another scam like it seems it could be? I’m glad to see that you have done your research before buying into it because there are too many scams out there so you need to ensure you really know what you’re in front of in order to make an educated decision. Here you will find out what secretmillionairetraining.com really is about, whether it will help you make money or not and more. 2 What is Secret Millionaire Training about? 3 How does Secret Millionaire Training really work? 4 Is Secret Millionaire Training a scam? What is Secret Millionaire Training about? The Secret Millionaire Training sales page looks like a get-rich-quick scheme because it has the typical characteristics (a high income claim, a lack of important information…). 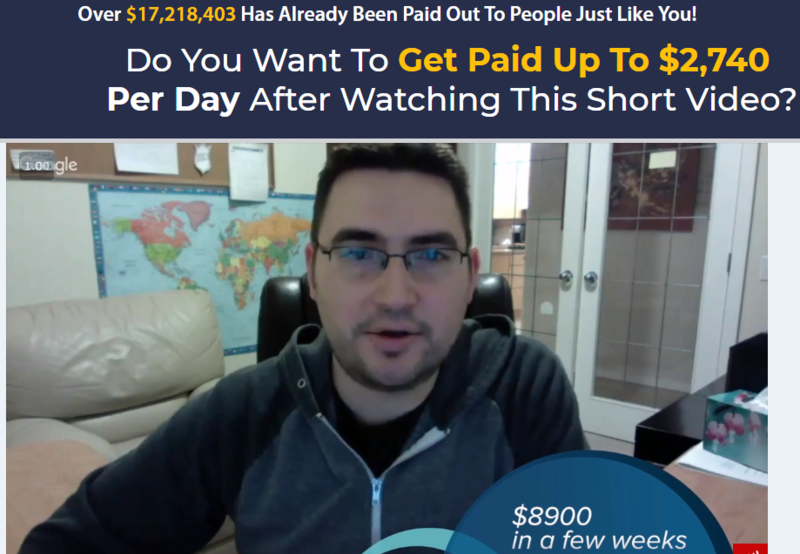 Who wouldn’t get excited to come across a page that says things like “Get paid up to $2,740 per day after watching this short video”? I know I would have got excited back when I didn’t know anything about the online money-making world, but now that I know what it takes to earn money online I don’t get too excited anymore. I still remember when I used to come across pages like the Secret Millionaire Training and had the hope that one of these get-rich-schemes would work. I just couldn’t believe they were all scams. It can make you $1000-$25,000 in commissions. It doesn’t require you to do anything technical. It doesn’t require you to have any prior experience. It doesn’t require you to create your own products. It works on complete autopilot. You’ll get a millionaire mentor after buying it. You’ll basically have to send people to the website you’ll be given and the rest is done-for-you. The spokesman, Jeff Lerner, makes it seem likes it not that hard to make $2,740 per day and become a millionaire. After all, all you have to do is master 3 easy steps and you can do this within a week, at least that what he says. And what about the people who appear in the sales video? They all claim to have made thousands of dollars in a short amount of time thanks to this incredible system. How cool is that? Therefore, is Secret Millionaire Training really this amazing? Will it enable everyone to make money online? Or is there something that you need to know that the sales video doesn’t tell you? Let’s see how this system really works. How does Secret Millionaire Training really work? 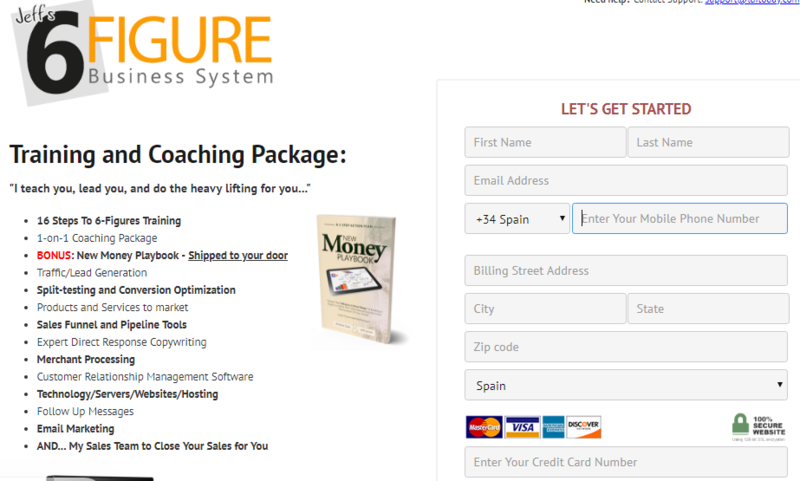 Firstly, what you need to know is that Secret Millionaire Training is not a system itself. Notice that there are no logos in the Secret Millionaire Training sales page? Well, it’s because secretmillionairetraining.com is just a page being used to promote another program, the Jeff’s 6 Figure Business System a.k.a. the 16 Steps to 6 Figures a.k.a. Ultimate Laptop Lifestyle. In order to try this system, you’ll have to pay an initial fee of $49. But this is only the beginning. It would make no sense that they sold a system that generates millions of dollars just for $49. 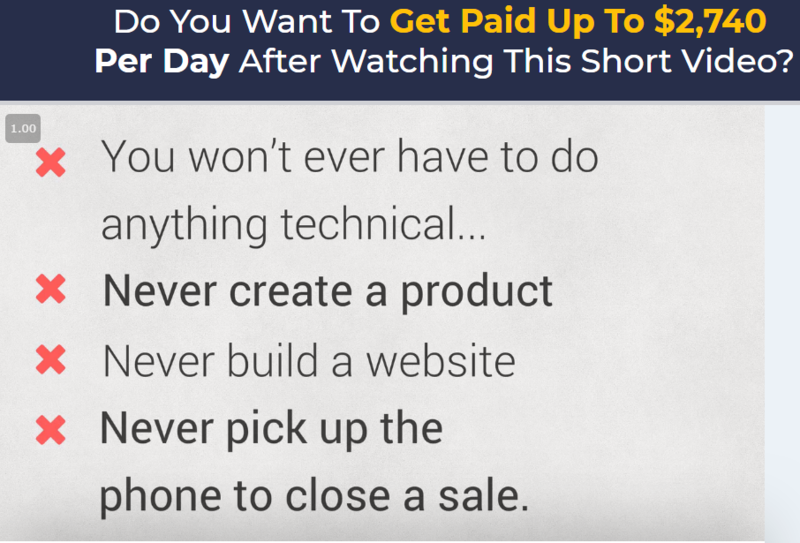 What Jeff does not tell you in the sales video is that you’ll have to spend thousands of dollars in other products in order to have “the right” to promote them and earn the huge commissions of $1000-$25,000. Note that if you want to earn a thousand dollars in commissions, you’ll have to spend at least two thousand dollars. So you’ll have to spend over $25,000 on another marketing package in order to be eligible to earn it back. Wondering why they ask for your phone number in the checkout page? Well, after paying the $49 fee, you’re going to get a call from your “millionaire mentor”, who might not even be a millionaire. This “millionaire mentor” can also be called your sponsor or a sales person, someone who’s going to have one on one calls with you to try to get you to spend a lot of money on the pricey digital marketing packages. Why? Because he/she gets to make a commission off your purchases. And the reason why he/she is going to close the sales for you is because he/she also gets to make money whenever your recruits makes a purchases. In other words, he/she is going to earn money off your sales. 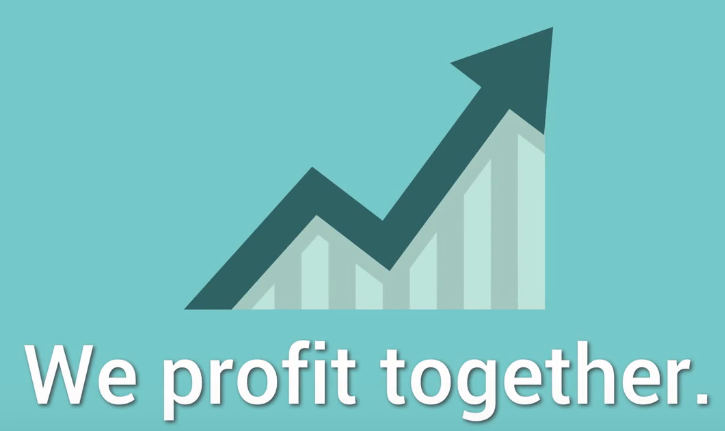 Remember that Jeff claims you profit together? That’s it. Everytime you make money, he and your sponsor make money too. This system works just like other MLM companies but the difference between this system and companies like Avon is that the 6 Figure Business System is about digital marketing and the products are very expensive, while Avon’s products are physical ones and they’re not that expensive. The 6 Figure Business System is no different than the Empower Network that got shut down last year and Digital Altitude that recently got sued by the FTC for over $14,000,000 in fraud. I’m glad that I have never been involved in these high-ticket MLM programs because most of them don’t last. Most of the people who get to earn the big bucks are the ones who joined at the early stages, but the ones who get to join later are the ones at the bottom and a lot of them even lose the money they’ve invested. That’s it. The average person who follows the training of this program makes little to no money. Is Secret Millionaire Training a scam? Yes, I consider the Secret Millionaire Training to be a scam because it’s not a real program itself and the sales page and video are deceitful and contain misleading information. After explaining how it really works, let’s see some of the red flags and what I don’t like about this system. Wondering why they don’t mention the name of the real program? They hide this from you because you would be more likely not to join if you knew the truth about this program. They usually create funnel pages like secretmillionairetraining.com and create various names to promote the same program in order to escape from the “negative honest” reviews written by people like me who expose them for what they are. And when it comes to the cost, they’re not going to say how much you really need to spend to make the huge bucks because you wouldn’t even pay for the initial fee if you knew how much it really costs. I personally don’t like programs like this that hide important information because it doesn’t help people make educated decisions. There’s no such thing as an autopilot system, especially if this is a high-ticket program. The way they’re promoting this program is by doing paid advertising. But the thing is, they need to spend a lot of money on advertising because there are not many people who’re going to get involved in a program like this. Honestly, most people do not have thousands of dollars to spend on programs like this and the crazy ones who end up investing get loans and end up in debt. Therefore, this requires you to be constantly paying for ads to find the few people who’re willing to spend their life savings on this. To be honest, I couldn’t help but laugh the moment I heard Jeff claim that you’ve been selected out of thousands of people to watch that video. I’ve lost the count of the times I’ve heard that in other scam videos. The truth is that anyone who has an electronic device and an Internet connection can watch that video. Apart from that, he pressures you to buy it by telling you that there are a few spots left or that your discount is going to expire. Truth be told, the number of spots is unlimited as they want as many people as possible to purchase this, and there’s no such thing as a discount because this system has always cost $49 to join. I definitely don’t recommend that you fall for secretmillionairetraining.com and get into the 6 Figure Business System. When it comes to making money online, you need to stay away from all programs and systems that make high income claims in a short period of time because most of them are scams or low-quality programs. Apart from that, you also need to know that you don’t need to spend thousands of dollars to start making money. Even though any business has a certain level of risk, you don’t need to reach the point where you’re spending your life savings on an online business or money-making opportunity. The business model I use enables me to choose the products I want to promote (I’m not forced to buy the products of a certain company in order to promote them) and doesn’t require me to pay for traffic to make money because I know how to get free traffic. All of this is not easy and requires real work. I didn’t make my first dollar overnight but I have no regrets for putting in the effort. This business has given me a way to earn a consistent income month after month. I believe you can do what I’m doing if you’re willing to learn, work, stay patient and be persistent. With the proper training, marketing tools and support, you’ll be well on your way to success. You’ll find out how this business works, how you can get started for free and more! You’ll also get help and support from me, and will get to meet a big community of bloggers and Internet entrepreneurs who’re also willing to help you out! I hope this review has been helpful and now you have enough information to make a good decision. If you have any questions or opinions, feel free to leave a comment below and I’ll get back to you ASAP. Crypto Coin Crusher review – Scam or $1K per day? RetailRecruit.org review – Amazon SCAM exposed here!